Apollo Health & Lifestyle (AHLL), a subsidiary of Apollo Hospitals Enterprise (AHEL) and one of the largest players in the retail health care segment in India, is expected to reach break-even on earnings before interest, tax, depreciation and amortisation (Ebitda) next financial year. The management has said AHLL’s revenue has been growing well — it has clocked a 28 per cent growth and there is also a marginal improvement of roughly around 2-2.5 per cent till the end of last quarter. Ebitda had seen a growth of around 34 per cent compared to the last year during the period. By FY20, AHLL should be Ebitda break-even, said Suneeta Reddy, managing director, AHLL in an analyst call. Growth of Apollo Spectra, which provides the day surgery facilities, was muted with elective surgeries not growing during the festival season, but this is assumed to grow now. The utilisation levels in the operation theatre are over 39 per cent at present and the company expects it to be higher in the near future. For its birthcare format Cradle, the company is expecting a 45-50 per cent bed utilisation in the next financial year. AHLL runs the largest chain of standardised primary healthcare models — multi-speciality clinics under the brand Apollo Clinics in India and the Middle East, diabetes management clinics Apollo Sugar, Apollo Diagnostics, apart from the specialty formats. AHEL has said it will realise the value of its investments into the joint venture Apollo Munich Health Insurance through an exit. 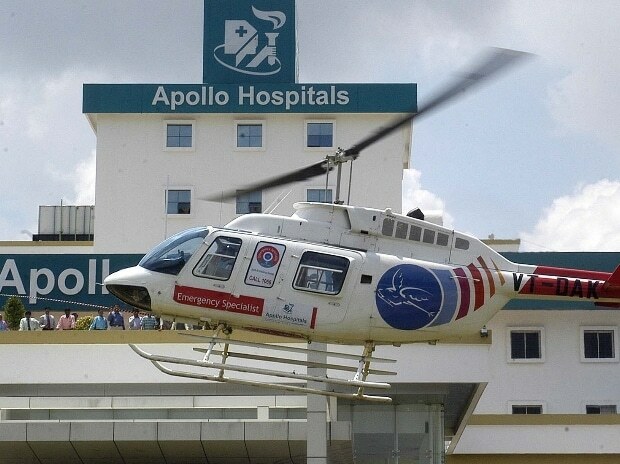 According to the regulatory disclosure of these companies, around 50.95 per cent is with the Indian shareholder, which is Apollo Hospitals Group, of which around 10 per cent of the shares is with AHEL. The group has invested Rs 500-600 crore into the health insurance JV. The valuation is a factor of gross written premium (GWP) and invested capital, and one should at the value that has been generated over a period of time, she told the analysts. Till December 2018, the insurance business achieved a GWP of Rs 1287.9 crore against a GWP of Rs 992.8 crore in the same period previous year. The total income of the insurance firm was Rs 441.2 crore during the quarter ended December 31, 2018, as compared to Rs 348.1 crore during the same quarter of last year, with a 27 per cent growth. It has posted a net loss of Rs 10.1 crore during the quarter compared to the Rs 20.3 crore net profit same quarter last year. The assets under management stood at Rs 1,393.2 crore as on December 31, 2018.